I decided recently it was time to move to a bluetooth headset at the gym after several traumatic events like throwing my phone across the gym or dropping it directly on the big red “stop” button on my treadmill while I was feverishly running. Conclusion: the wires are getting in the way. Suddenly, though, the iPhone 7 was released, had it’s headphone jack has been removed. A bunch of people are about to be in the market for bluetooth headphones, so this is perfectly timed. SkullCandy XTfree: MSRP $99, Amazon for $75. Battery life: 6 hours. 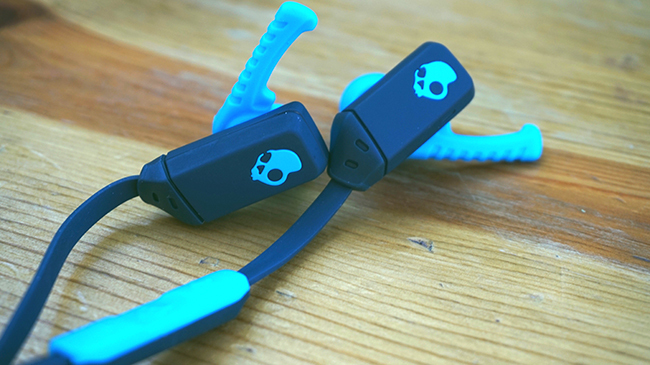 SkullCandy is traditionally edgy with their headset designs, and as small as they are, the XTfree are no exception. A multicolored “FitFin” highlights the set and allows you to position it solidly in your ear. We found we rarely pressed the Fin into our ears because the headphones stayed in place fine without it. These headphones were comfortable and sounded great, plus the controls are simple and familiar in their interface, though they’re located on the left of the wire instead of the more familiar right hand side, which meant I often reached for the controls on the wrong side. The XTfree includes different sized earpieces as well as “playthough” sets, which allow a little more sound through if you prefer. A mesh carry bag is included. Pros: stylish, affordable, and lightweight. fun color combinations. Playthrough earpieces are a thoughtful touch. Cons: controls are on the opposite side than I’m used to. In-ear headphones can be hard to adjust and set in your ear canal. Monster iSport SuperSlim: MSRP $149, Amazon for $90. Battery life: 6 hours. iSport Superslim offer a very small overall profile for a bluetooth headset. 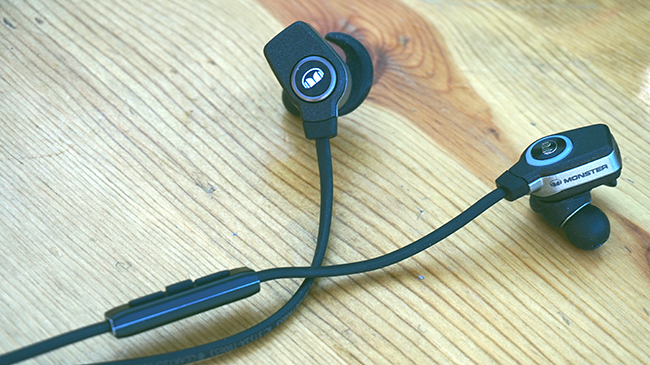 Because they’re in-ear, they provide some noise canceling as a result. 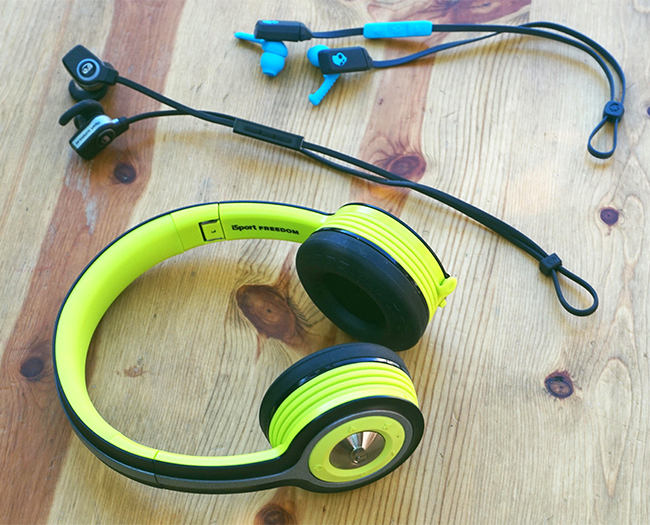 The SuperSlim comes with a mesh headphone bag and various replaceable rubber earpieces. The remote control offers 3 familiar buttons and they are located on the right side of the wire: the “normal” location if you’ve been using the wired Apple headset, for instance. The rubber “curl” on the set lays comfortable and naturally in your ear. Pros: lightweight and comfortable. Familiar placement of controls. Cons: in-ear headphones can be hard to adjust and set in your ear canal. 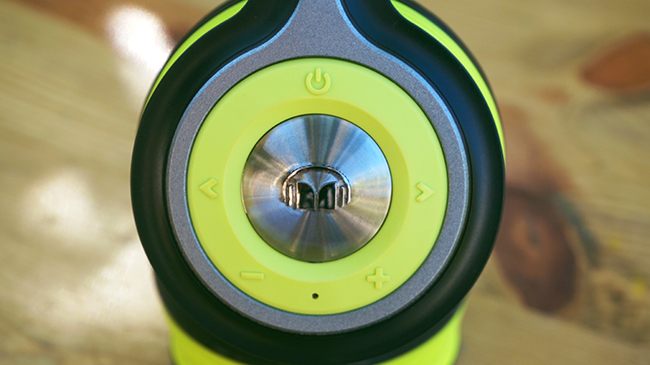 Monster iSport Freedom: MSRP $199, Amazon for $150. Battery life: 9+ hours. Pictured at the top of this post. Though I found a few things I didn’t like about the iSport Freedoms, I personally prefer headphones like this (on-ear) vs the ear canal style (though my wife likes the in-ear). These headphones fit snugly and block outside sounds very well for non-noise cancelling headphones, and they fold for travel into their included canvas carry bag. 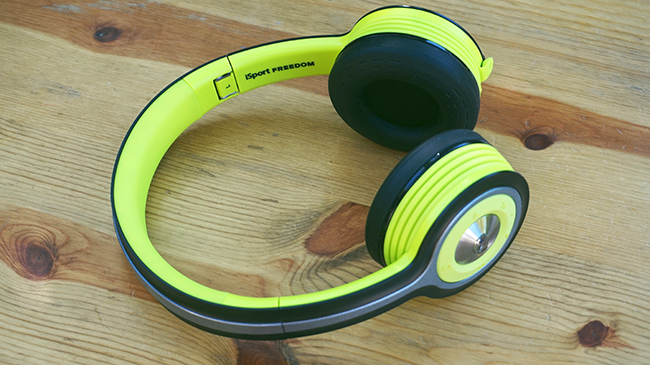 As you’d expect from an active headphone, iSport Freedom stays put on your head, even while running and bending over. These headphones have a plethora of included controls and options, with a total of 6 buttons: volume up, volume down, track forward, track backward, power/pair and play/pause. They also include a stereo minijack, so you can use them as wired headphones if your battery dies, but battery life is quite a bit longer that of the smaller headphones above. Though the assortment of buttons are a nice feature on the Freedom, I usually couldn’t find the ones I needed in the midst of a workout, other than the large play/pause button, which is basically the whole right side of the set (see the image above for the control layout). You can use all of these bluetooth headsets for phone calls, but because the Freedoms don’t have a “hanging” mic like the other sets, callers found it harder to hear me with the Freedoms than the other sets mentioned here. I plan to use them strictly for listening at the gym and rarely for phone calls, so this wasn’t a deal-breaker. Because of my preference of these sets to in-ear headphones, I’ll be using the iSport Freedom for my future workouts. Pros: long battery life. Easy to take on and off. Sturdy and comfortable. Cons: controls are hard to find when you’re working out. Microphone is a useful feature, but too highly-placed for phone calls. This entry was posted by admin in electronics, reviews and tagged bluetooth headphones, iphone 7 bluetooth headphones, iphone 7 headphones, iphone bluetooth headphones, monster bluetooth headphones, monster headphones, Monster iSport Freedom, Monster iSport Freedom review, monster isport superslim, monster isport superslim review, monster wireless headphones, SkullCandy headphones, SkullCandy XTfree, wireless headphones, wireless workout headphones, workout headphones on September 20, 2016 .